Jackson brought in three of eight targets for 68 yards and a touchdown and also rushed once for four yards in the Buccaneers' 37-34 loss to the Bengals on Sunday. 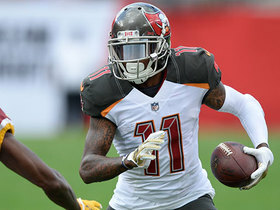 Jackson recently requested to be traded from the Buccaneers, but the team has informed the wideout it has no intention of dealing him ahead of Tuesday's deadline, Ian Rapoport of NFL Network reports. Jackson brought in two of his five targets for 25 yards and also rushed twice for eight yards and a touchdown in the Buccaneers' 26-23 overtime win over the Browns on Sunday. Jackson caught four of nine targets for 77 yards and added a seven-yard run during Sunday's 34-29 loss to Atlanta. He also returned one punt for nine yards. Analysis: The production wasn't quite up to Jackson's standards, particularly as compared to his monster first two weeks, but there was reason for hope. In Jameis Winston's first start of the season, Jackson was targeted a season-high nine times. He and Winston didn't connect on the majority of those attempts, but at least some of that can be attributed to rust. They won't have too much time to straighten things out before taking on a tough Cleveland pass defense Sunday. 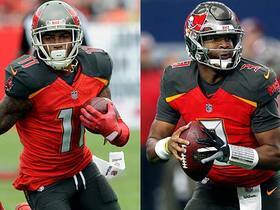 Jackson brought in five of eight targets of 112 yards in the Buccaneers' 48-10 loss to the Bears on Sunday. He also returned one punt for two yards. 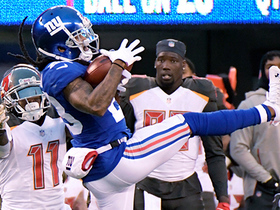 Jackson brought in three of five targets for 37 yards in the Buccaneers' 30-27 loss to the Steelers on Monday night. He also netted zero yards on his sole punt return. Jackson brought in all four of his targets for 129 yards and a touchdown in the Buccaneers' 27-21 win over the Eagles on Sunday. He also returned one punt for 11 yards. 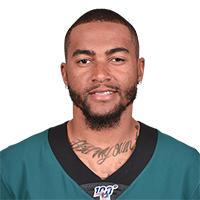 Jackson (concussion) is active for Sunday's Week 2 tilt against the Eagles, Scott Smith of the Buccaneers' official site reports. Analysis: All indications are the veteran speedster will take his usual spot in the starting lineup as the No. 2 receiver opposite Mike Evans. Jackson will look to build on a stellar Week 1 effort versus the Saints where he finished with five receptions for 146 yards and two touchdowns despite exiting early with a shoulder injury. Jackson cleared the NFL's concussion protocol Saturday and is expected to start Sunday against the Eagles, a source told Peter Schrager of FoxSports.com. Updating a previous report, Jackson is expected to clear the concussion protocol and play in Sunday's game against the Eagles, Jeremy Fowler of ESPN.com reports. Analysis: Jackson practiced in full Friday, but such activity doesn't mean he emerged from the protocol even though there are reports the veteran has already cleared. Because he's slated to do so and may have been cleared since the time of Fowler's report, Jackson should act as the No. 2 wide receiver behind Mike Evans in Week 2. Expect Jackson's status to be fully clarified approximately 90 minutes before Sunday's 1:00 PM ET kickoff. 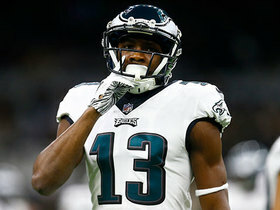 Jackson (concussion) has cleared the league's protocol and will suit up against the Eagles on Sunday, Derrick Gunn of NBC Sports Philadelphia reports. Analysis: Jackson's Week 2 status is no surprise after he managed to fully participate in Friday's practice. The veteran speedster looks fully healthy after blowing up for five receptions, 146 yards and two touchdowns in the Buccaneers' season opener. Jackson will attempt to log another impressive performance against the Eagles' stout secondary. Analysis: Jackson's Week 2 status is no surprise after he managed to fully participate in Friday's practice. The veteran speedster looks fully healthy after blowing up for five receptions,146 yards and two touchdowns in the Buccaneers' season opener. Jackson will attempt to log another impressive performance against the Eagles' stout secondary. Jackson (concussion) is expected to clear protocol and suit up for the Bucs' Week 2 matchup with the Eagles, Jeremy Fowler of ESPN.com reports. Analysis: Jackson was a full participant at Friday's practice, so he has been trending in this direction. Barring any setbacks, he should full go against the defending champions. Still, final confirmation on his status is not expected until closer to kickoff. The veteran speedster racked up an impressive 146 yards and two touchdowns on five receptions in Week 1. Jackson (concussion) was a full participant at Friday's practice and is listed as questionable for Sunday's game against Philadelphia, Scott Smith of the Buccaneers' official site reports. Analysis: Jackson started as a non-participant Wednesday and progressed to limited participation Thursday. The listing on Friday's injury report suggests he's on the right side of 'questionable', but we may not have a final answer until some point over the weekend. Fortunately, the Bucs are scheduled for a 1:00 PM ET kickoff in a tricky matchup with the defending champs. Chris Godwin will take on extra snaps and targets if Jackson doesn't end up playing. 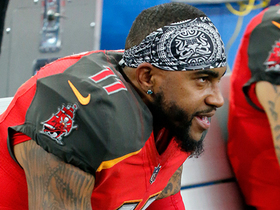 Jackson (concussion) was spotted during the portion of Friday's practice open to the media, according to Scott Smith of the Buccaneers' official site. Analysis: It won't be clear until after practice how much work Jackson was able to get in, but his presence alone bodes well for his chances of playing Sunday against the Steelers. The Buccaneers will reveal Jackson's status for Week 2 after Friday's session comes to a close. Jackson (shoulder/concussion) was a limited participant at Thursday's practice, Jenna Laine of ESPN.com reports. Analysis: Jackson has made enough progress through the concussion protocol to take part in individual drills, but that's where the buck stopped Thursday. No matter, he seems to be on the right path to miss no time as a result of a head injury. His listing on Friday's injury report will be telling for his potential to play Sunday versus the Eagles. Jackson (shoulder/concussion) took part in the portion of Thursday's practice open to the media, James Palmer of NFL Network reports. Analysis: An active Jackson implies that he's reached stage three (of five) of the NFL's concussion protocol. Considering the work put in, he should be listed as a limited participant (at least) on Thursday's injury report, but the precise tag won't be known until its release. In any case, he seems on the right track to get through the protocol and suit up Sunday against the Eagles. Jackson (shoulder/concussion) didn't practice Wednesday, Jenna Laine of ESPN.com reports. Jackson is nursing a shoulder injury and remains in the NFL's concussion protocol ahead of the Buccaneers' first practice of the week Wednesday, Rick Stroud of the Tampa Bay Times reports. Jackson won't return to Sunday's game at New Orleans due to a concussion, Scott Smith of the Buccaneers' official site reports. Analysis: Jackson appeared to suffer a head injury in the fourth quarter, which forced visits to the sideline tent, and subsequently, the locker room. Now that he's in the concussion protocol, it may be a while before he gets to back up his 5-146-2 line on five targets from Week 1. An absence from Jackson would allow Chris Godwin and Adam Humphries to take on larger workloads. 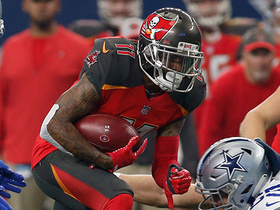 Jackson and Chris Godwin are both listed as starting options at wide receiver opposite Mike Evans on the Buccaneers' initial regular-season depth chart, Jenna Laine of ESPN.com reports. Jackson caught three of four targets for 36 yards in Friday's preseason loss to the Lions. Jackson secured two of three targets for 73 yards in the Buccaneers' 30-14 preseason win over the Titans on Saturday. Jackson secured his only target for 18 yards in the Buccaneers' 26-24 preseason win over the Dolphins on Thursday. Jackson received reps as the second-string punt returner behind Adam Humphries during Thursday's practice, Scott Smith of the team's official site reports. Jackson has impressed through the first several training camp practices by making catches all over the field, Carmen Vitali of the team's official site reports. Jackson was present for the start of OTAs last week, Jenna Laine of ESPN.com reports. Analysis: Jackson is known for training the majority of the offseason in his native California, where he typically engages in a program focused on speed. However, he was present and accounted for at the first day of OTAs last week as part of his ongoing effort to build additional chemistry with Jameis Winston. Despite his presence last week, Jackson is not expected to attend every voluntary offseason practice, as he's also trying to keep up with his normal offseason regimen as much as possible. Buccaneers coach Dirk Koetter said he expects Jackson to have much better production in 2018, noting that the team made an entire tape of plays where the veteran wideout was open but didn't get the ball, Greg Auman of the Tampa Bay Times reports. Tampa police are no longer investigating a Dec. 24 incident involving a car registered to Jackson, Austin Knoblauch of NFL.com reports. Jackson (ankle) finished his first Buccaneers season with 50 receptions (on 91 targets) for 668 yards and three touchdowns over 14 games. He also rushed three times for 38 yards. Jackson (ankle) is inactive for Sunday's Week 17 tilt against the Saints, Scott Smith of the team's official site reports. 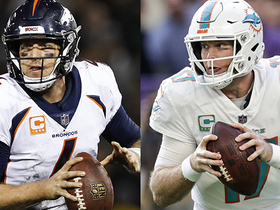 Analysis: The veteran speedster had practiced in a limited fashion throughout the week, but with nothing to play for in the season finale, he won't be exposed to potential further damage. Jackson missed the Week 16 tilt against the Panthers as well, and as was the case in that contest, rookie Chris Godwin (ankle) will slot in as the No. 2 wideout alongside Mike Evans in Jackson's stead. Jackson (ankle) is listed as questionable for Sunday's game against the Saints, Jenna Laine of ESPN.com reports. Jackson (ankle) was listed as a limited participant at Wednesday's practice. Analysis: Jackson's sprained left ankle forced his first absence of the season in the Week 16 loss to the Panthers, but his attendance for the team's first practice of the current week portends well for his availability for the season finale against the Saints. If the wideout is able to put forth a full practice Thursday or Friday, he'll likely reclaim his starting role Sunday, resulting in fewer targets to go around for Adam Humphries and Chris Godwin (ankle). Jackson (ankle) participated in practice Wednesday, Rick Stroud of the Tampa Bay Times reports. Analysis: In the aftermath of the Buccaneers' Week 15 loss to the Falcons, Jackson required crutches to move about and had a walking boot on his left foot. Eventually, he was diagnosed with a sprained ankle, which kept him out of practice last week. Because Wednesday's appearance marks his first since the injury, he may be eased into drills in order to avoid any sort of setback. That said, his activity level will be known upon the release of the first Week 17 injury report. Jackson (ankle) has been ruled out for Sunday's game in Carolina, Jenna Laine of ESPN.com repots. Analysis: Jackson hurt his ankle in Monday's loss to the Falcons and didn't log any form of practice participation this week. His status also seems to be in jeopardy for the regular-season finale, potentially allowing third-round rookie Chris Godwin to take on a starting role for the final two weeks of the season. There isn't much incentive for the Bucs to put Jackson on the field at far less than 100 percent strength. Jackson (ankle) was not spotted at Friday's practice, Greg Auman of the Tampa Bay Times reports. Analysis: Jackson has not practiced at all this week, so his chances of playing in Sunday's matchup with the Panthers are not good. The Buccaneers will reveal Jackson's official status for Week 16 after Friday's practice comes to a close. Jackson (ankle) was a non-participant at Wednesday's practice, Greg Auman of the Tampa Bay Times reports. Jackson (ankle) was seen in a walking boot and crutches following Monday night's loss to the Falcons, Greg Auman of the Tampa Bay Times reports. Analysis: Jackson exited early in the contest but returned before ultimately leaving the game for good with a left ankle injury. The severity of the injury is unlikely to be fully known until later in the week, and at this point the veteran receiver should be considered day-to-day at best as next week's matchup with the Panthers approaches. Jackson is doubtful to return to Monday's game against the Falcons due to an ankle injury, Kelsey Conway of the Falcons' official site reports. Analysis: Jackson went down early in the game with an apparent leg injury, but ultimately returned. Assuming he remains sidelined, his night will end with one reception for seven yards. Adam Humphries and Chris Goodwin figure to see increased targets as a result of Jackson's absence. Expect an update on the veteran pass-catcher's status once the team provides more information. Jackson brought in four of seven targets for 41 yards and added one rush for 23 yards in Sunday's 24-21 loss to the Lions. Jackson (foot) brought in two of three targets for 24 yards in Sunday's 26-20 overtime loss to the Packers. Jackson (foot) is active for Sunday's Week 13 tilt against the Packers. Analysis: The veteran speedster will thus be on the field and starting in Jameis Winston's return from a three-game absence due to a shoulder injury. Jackson could have some opportunities downfield against a Packers defense that's allowed 259.4 passing yards and 175.1 yards to wide receivers per game this season. Jackson (foot) is listed as questionable for Sunday's game in Green Bay, Tom Silverstein of the Milwaukee Journal Sentinel reports. Jackson (foot) was limited in Thursday's practice, Tom Silverstein of the Milwaukee Journal Sentinel reports. Jackson was held out of practice Wednesday due to a foot injury, Jenna Laine of ESPN.com reports. Analysis: Jackson tended to an ankle injury throughout his first preseason with the Buccaneers, but the veteran wideout has otherwise been a beacon of health in 2017. With a unknown foot issue in tow, his status should be monitored with a watchful eye to inform about his availability for Sunday's game in Green Bay. 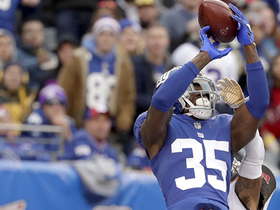 Jackson parlayed 11 targets into eight catches for 60 yards in Sunday's 34-20 loss to the Falcons. Jackson secured two of three targets for 28 yards and a touchdown in Sunday's 30-20 win over the Dolphins. 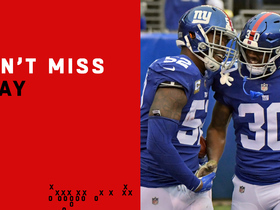 Jackson brought in six of 10 targets for 82 yards in Sunday's 15-10 win over the Jets. Analysis: As expected, Jackson saw a slight increase in attention with Mike Evans (suspension) out of uniform. The veteran speedster accounted for nearly half of quarterback Ryan Fitzpatrick's yardage total and managed season-best reception and target totals in the process. Jackson is still looking to establish some downfield success, however, as his longest reception of the season is a relatively modest 41 yards. He'll look to build on Sunday's effort against the Dolphins in Week 11. 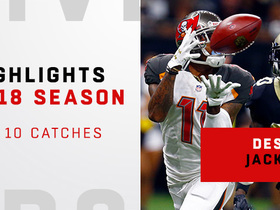 Jackson, who's seen a significant drop in his trademark deep-ball success in his first Buccaneers season, is likely to see an increased target share in Week 10 with Mike Evans (suspension) out. Jackson secured two of four targets for 25 yards in Sunday's 30-10 loss to the Saints.